Do Juniors Respond to Emergency Calls? The Staunton Fire Protection District Junior Firefighter Program allows young people from the ages of 16 to 19 years of age to actively participate in fire department activities. Over the past 10 years, over 20 different youths have participated in the Junior Firefighter Program. 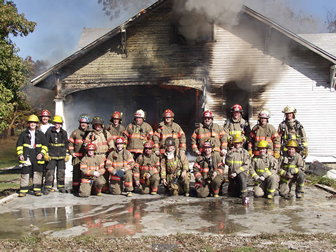 Almost half of the youths who participated in the program have joined the Staunton Fire Department as regular firefighters when they reached the age of 19. What kind of activities do members of the Junior Firefighter Program do? Junior Firefighters are considered support members of the Staunton Fire Protection District, but they are allowed to take part in many fire department activities. Junior Firefighters attend fire department training sessions, assist with maintenance operations, assist with fund raising activities, assist in public education functions, attend departmental functions and meetings, and are allowed to respond to specific types of incidents and perform support roles at incident scenes. What benefits do members of the Junior Firefighter Program receive? Youths who participate in the Junior Firefighter Program receive many different benefits. Besides learning new skills, they develop new friendships, are frequently faced with new challenges, able to serve their community, and develop future job skills. As a Junior Firefighter, you will also receive departmental uniforms and personal protective equipment. Junior Firefighters are invited to attend all department social functions which include the annual dinner dance, picnics, and sporting events. At the age of 19, and upon completion of high schoo,l a Junior Firefigther may apply to become a regualar firefigther within the department, when they apply their application will be moved to the top of the list for consideration.